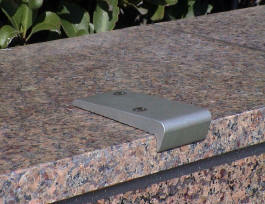 Radius FR012 Skate Deterrents - Eliminate damage to property caused by skaters by installing Skate Stoppers. Applications: Designed for walls with 1/8" radius edge (may be used in place of model FA90). FR0.12 is most commonly used on granite, marble, stone, block, brick, or other surfaces with a hard corner. May also be used on wood and plastic boards (not exceeding 2" thick) or aluminum seating. Size: Outside dimensions: 4.875" (top) x 1.0" (face) x 2.0" wide. Material and finishes: Available in clear anodize (silver/gray) aluminum. Hard anodized (dark gray) subject to availability. Anchoring: Parts are anchored with two Smart Pins, affixed with two-part epoxy. Bronze is also available - please Contact Us for pricing on bronze pieces.